Weaving It Together connects high-interest readings with clear writing activities. Learners build both reading and writing skills through understanding relevant readings and confidently expressing concepts and ideas in carefully structured writing exercises. By connecting these two necessary competencies, learners seamlessly develop both language and academic skills. • Enhanced vocabulary instruction teaches students how to build vocabulary and words in different contexts. • Updated reading passages on intriguing topics stimulate students to write creatively and act as models for student writing. • Revised discussion and critical thinking questions include more exercises that challenge students to become better readers. • "What Do You Think?" section in each unit introduces the unit theme and provides a comprehension check at the end of each unit, connecting the content to students' lives. 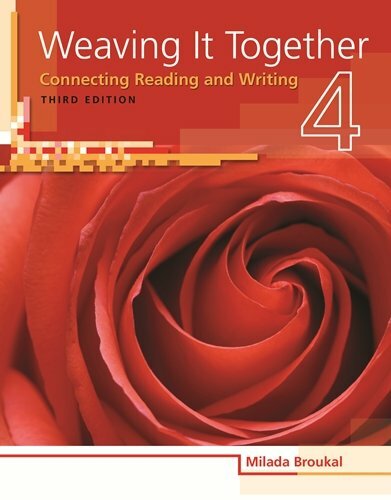 • "Weaving it Together" sections include "Connecting to the Internet" activities and "Timed Writing" prompts, offering a full-circle connection of the unit theme to the reading and writing.